First, you can see that I've changed the look of my blog. A few people , including my son, said the font was hard to read , so I decided to go with something simpler.....I hope you like it!! Soon I hope to figure out how to customize it......but that may take some time. I want to do a few updates.....got some pics of our dogs that had been adopted....I always love those!!!! Tommy first......he is such a sweet boy....thought we might have a hard time adopting him since he is a bigger boy and a husky mix......wrong!!! He is having a wonderful time with his family....as you can see from the pics below!!! His name is Koda now , and I wish him the best.....have a great time my lovely boy!!!! You remember Whitney??? She was the little girl that we had to hand feed, she had distemper, and a myriad of other problems. But look at her now!!!! Where's Koda...I have to keep him in line!!! Having a nap with her younger brother!!!! She has fit in perfectly and those two love each other......love you my sweet girl!!!! I have to add a dog that is from another rescue , Best Friends FurEver. Bud is a great Pit that was housed at a kennel where we have some of our dogs. When I would go to visit our babies I would visit with him and another Pit, Spencer. I'd take them for walks and let them have some time in the play areas with me. Bud was just adopted by the office manager there and I know she'll take the best care of him. One last thing, click on this link to see our article in Cy-Fair Magazine!!!!! First, sorry it took me so long to post...had one of those freak storms over the weekend and lost power for 14 hours.......I was way off in the things that needed to be caught up on....so here I am now!! I was going to talk about a few dogs in this post.....but I am dedicating it to my fav girl Charlina!!! 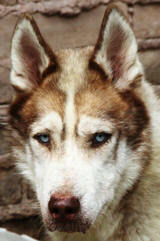 Charlina came into the Husky Haven program about two and a half years ago. She had a fracture in her pelvis, you can only imagine how that happened (I prefer not to) along with other health problems. We kept her calm and crated, hoping the fracture would heal , and it did. We still kept her from too many dogs for a while, didn't want her to re injure herself. She turned out to be the prettiest, most friendly girl, if I hadn't had too many dogs myself I would have adopted her.......but I decided to make it my mission to take her to as many shows as I could.....hoping to get her exposure and a new home. And to shows she went, she was so well behaved, kids and adults loved her.......I expected after every show that there would be a ton of applications.....but never one!!!! I was so disappointing.....but I kept taking her. In January, a nice couple had seen her on the website and wanted to foster......it wasn't an adoption, but gave her a chance to be in a home situation. Sadly, the couple decided this month to move back to California and Charlina came back to us. This last weekend Husky Haven had a couple of things going on, I was helping with an adoption and a couple of the other volunteers were working a small show. Since Charlina was back, she could go to the show, but the couple coming for adoption were looking for a B and W, Blue eyed female. Although she was a bit older than they were looking for we decided to give her a chance at a possible adoption. I sent Tilton off to the show and kept my fingers crossed!!! They drove in from Austin and showed pics of their girl, she had died from a tumor at only five years old.....I was so sad for them, but was grateful that they were looking to bring someone else into their home to love and take care of. They looked at all our girls, but took a second look at Charlina!!! In the end, my wonderful girl found herself a great new family!!!!! I always believe that there is someone out there for every one of our dogs, this was her time!!! I would say I was sad, and maybe a little, but so happy that she gets a new life, she deserves it. So Charlina, I have to pick someone else to go to shows with, but I know you and your family won't mind. Charlina already is on FB and I will be posting new pics of her in her new home......Love you girl and have a happy life!!!!! So glad to be with my new buddy!!!! All I have is a pic from the website.....hopefully they will send me an updated picture. I wish both of these boys all my love and hope they have a happy life. Jack is a boy we just got into the program. 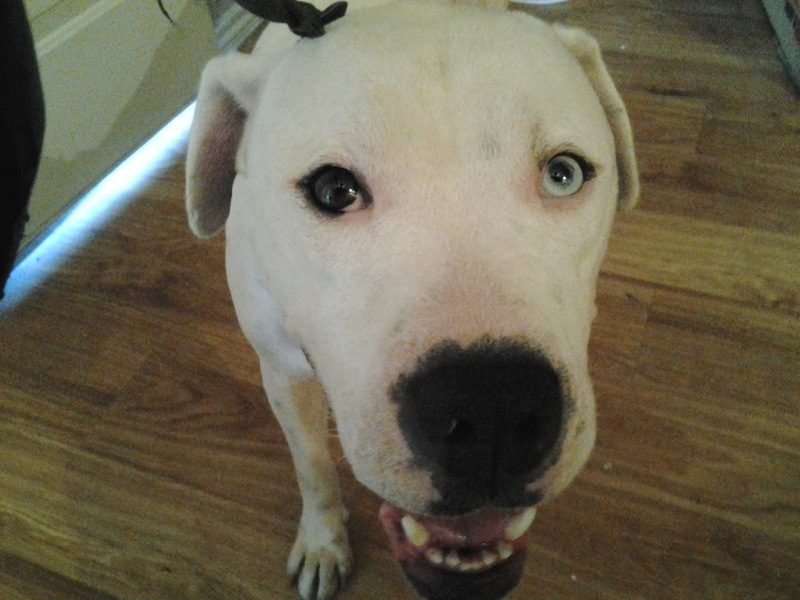 He was found wandering the subdivisions of Atascocita, when someone realized that he belonged to a family there. The dog was taken back , but the family was on vacation....they had left Jack and his running buddy, a white German Shepard, tied in the backyard with no food or water in sight!!!! A friend of ours took him in to her house and waited till the family came home. Apparently they really didn't want either one of them and they went to rescue. Our friend is still fostering Jack.....but we are looking for a foster/adoption.....she already has four dogs. He is crate trained , working on house training.....he was probably never let into the house!!! 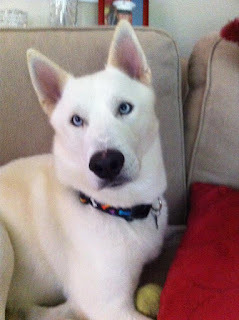 He is a sweet boy and needs a new home.....please check him out on www.huskyhaven.org. That's all for now.....BLD tomorrow , and not the greatest news....Later!!!! Alright, bad news first.....found out yesterday that BLD has not healed at all after his three months in his apparatus. Doc said that the bone was apparently dead and couldn't regenerate, he did spend a week in animal control before we got him. So, another operation tomorrow, take some of the bone from his elbow, make a new incision, take that bone and place it in the breaks and hope that it will regenerate.........I'm so depressed that this didn't work for my boy......and after $2000 in another operation, amputation may be the final way. You might ask why....we want to give that boy a chance and we have put in so much time and energy to make that happen. If you have something you could throw our way.....would really appreciate it. BLD still needs his name....go to our Paypal at www.huskyhaven.org....please help!!!!! So good news....our boy Albus got fostered tonight!!! He is a young guy , doesn't have a lot of manners.....has never been in the house.....but one of our fantastic foster guys decided to give him a chance.....Thanks Ron....and hope Mr Albus is a good boy!!! Wow....another week gone by......so many things going on this last week. Finally got Gunter to heartworm treatment....will be going to his new home soon. Have a couple of adoptions that happened in the last couple of weeks......Snow Girl was adopted the Sunday of Reliant.......she is such a sweet baby and I wish all the best for her in her new home!!!! Denver....who was with us at Reliant, is going to his new home this weekend. Apparently the little dogs his new owners have didn't bother him at all.....so I wish that boy a wonderful life!!!!! This last week we were working with some people in Louisiana , a six year old therapy dog had landed at animal control after a death in her owners family. She was promptly adopted, but not everyone in her new family had consented to the adoption........and she was about to go back to animal control. We got her pics posted on FB and a wonderful couple is going to adopt her today. I love it when things like that happen. This pic looks a little odd.....the family that just took her had her completely shaved.....never do that to your Husky!!!!!!!!! I just found out that she is being adopted as I type this!!!!!! So a bit about BLD.....we are still looking for his name......you know the drill!!! He is supposed to be going to the doc this week to see if he's ready to have his apparatus taken off ...I know he's getting sick of it, so I hope this happens soon, paws crossed!!!! Please tell me it's soon!!!!!! Well , that's it for now.....but I got a ton more stuff to go......Later!!!!!! !